There is only one thing you can count on in rally, the unexpected. Last year’s Rally in the 100 Acre Wood was bitter cold and cut short by a snow storm on the final day of the rally. This year, well, with the event moved back a month to March instead of February the weather was bound to be better. And it was, but only slightly. The day before the rally was to begin was sunny and right near 70 degrees, but that quickly changed. Clouds rolled in and a cold wind kicked up on Friday, with a chance of rain and/or snow that night into Saturday morning as the temps plummeted into the lower 30s. 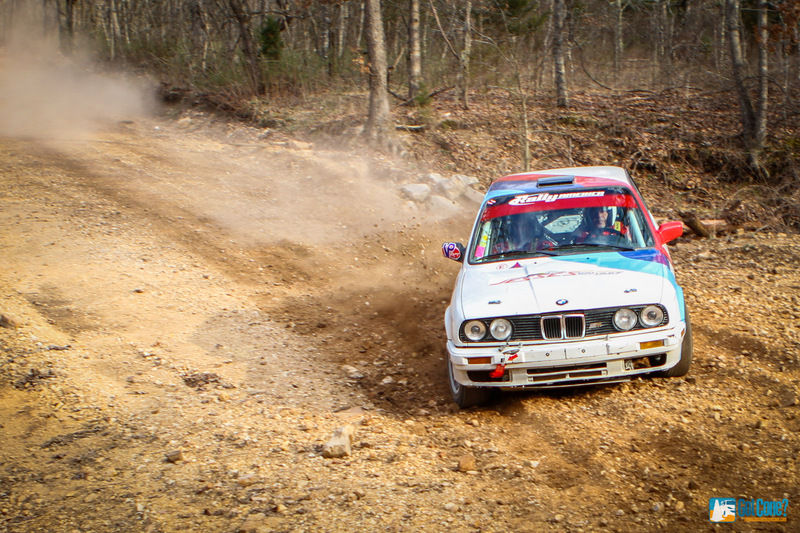 This year’s event turned out to be a dusty, rocky, treacherous, car eating, nasty one. Even a light rain on Friday night was not enough to keep the dust down, trust me, I inhaled a full meal of dust over the course of the weekend. Friday morning came around early, as I woke up at 6 AM to make my way out to shakedown stage. It was weird seeing the roads clear with no snow and it was glaringly obvious that years of wear had taken it’s toll on them. Large rocks were scattered everywhere along the side of the road. As cars made their way through the stages, even more large rocks were unearthed and slippery bare spots began to make an appearance. It’s no wonder that shakedown claimed a few victims with 5 offs. It was definitely a sign of things to come. 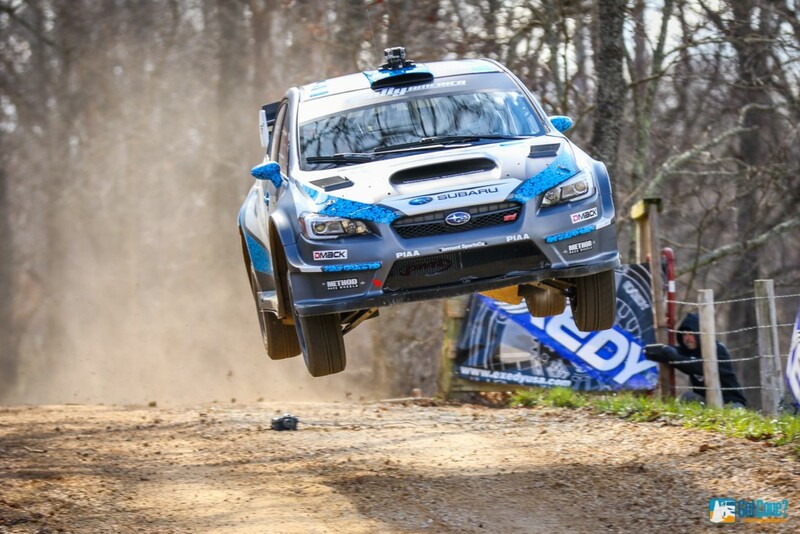 David Higgins and Craig Drew dominated the Rally America schedule last year, so they were the odds on favorites to take the win here. 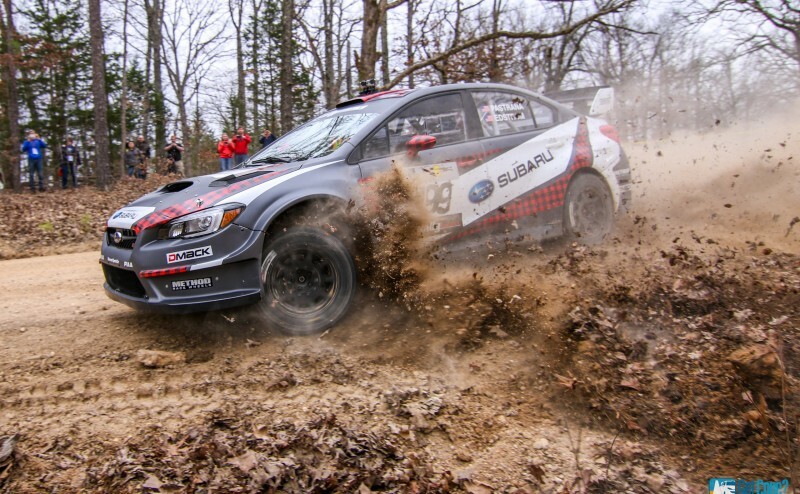 However, Travis Pastrana was back in a fresh Vermont Sportscar prepared Subaru, identical to Higgins’ 75 car, so he was bound to give them a run for their money. Pastrana also brought along his co-driver of days past, Christian Edstrom. A handful of others were in the mix, including Piotr Fetela, Nick Roberts and Lauchlin O’Sullivan, especially if one of the 2 factory Subaru cars suffered issues. Stage 1 was a precursor of the battle to come as Higgins took the stage victory by only 1.8 seconds over Pastrana and 5 other cars were within 30 seconds of his pace. 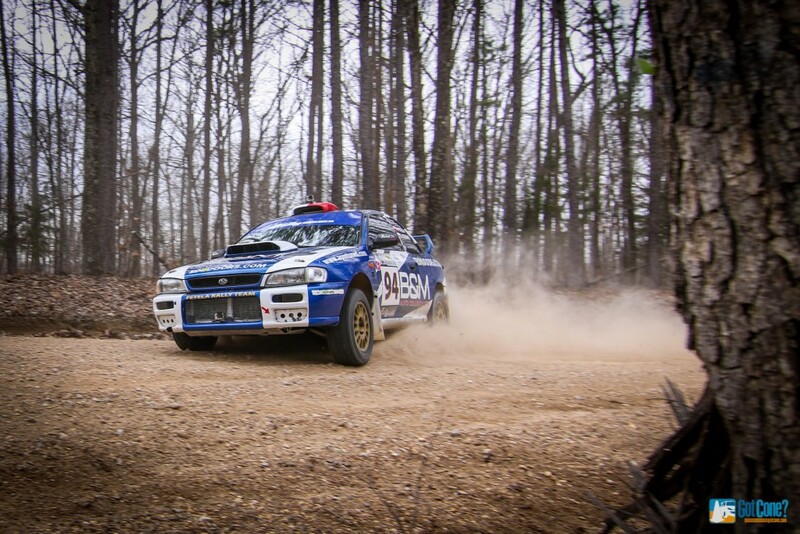 Pastrana hit back with a stage 2 win and Higgins grabbed stage 3 with a margin of only .8 seconds between the two. Pastrana then went on a run taking 5 of the next 6 stages. The day ended with only 8.7 seconds separating the 2 and setting up a great battle for Saturday. 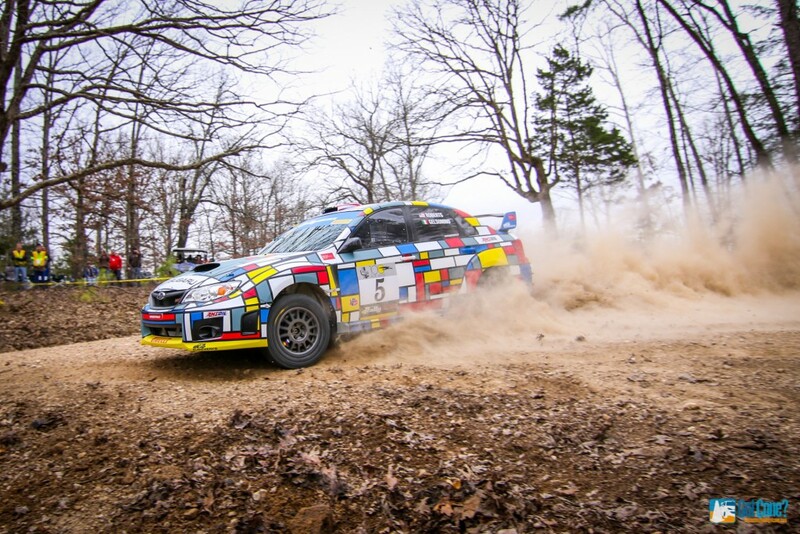 Nick Roberts and Alex Gelsomino sat in 3rd in their brightly colored Subaru, with O’Sullivan and Fetela rounding out the top 5. Saturday started with the famous Ollie stage that contains the cattle guard crossing jump. It was a brisk morning, but the sun was peaking out from behind partly cloudy skies as the first car, Pastrana’s #199 car approached. He flew through the air over the jump, landing a little off balance but the car settled down quickly. It was pretty obvious he was not about to let up and give Higgins an easy chance to catch him. The 75 car of Higgins and Drew was next over the jump and they hit just as fast and hard as they tried to catch Pastrana. A few more cars flew by, Roberts, O’Sullivan and then the truly unexpected happened. Fetela came flying over the jump, way faster and harder than the previous cars, but this wasn’t uncommon, he was always one of the highest flyers. The car landed hard and the driver’s side popped back up from the impact and then… well, one of the most horrifying crashes I’ve ever seen. The driver’s side front caught a ditch, hit a fence post and was hurled through the air, rolling over and over again. That would be the last flight for that poor Subaru as it gave up it’s life protecting the occupants of the car, both of whom were able to pull themselves out of the wreckage under their own power. The stage was quickly shut down and the rest of the cars transited slowly through, each given a quick reminder of the dangers of this sport. Fetela’s car was not the only victim of the 2016 Rally in the 100 Acre Wood. Well over 10 cars were forced to retire and more than a handful suffered critical damage. The good news, not one driver or co-driver was seriously injured. A great reminder that good safety equipment is important, very important. Meanwhile, the battle between Higgins and Pastrana raged on. Pastrana holding onto his lead until the penultimate stage when Higgins finally overtook him. But for Higgins and Drew it was not meant to be. As they made their way through the final stage and hit a large water crossing the impact blew off a hose and they lost power in their Subaru. They were forced to limp the car across the finish line losing over 2 minutes and the lead. Pastrana and Edstrom were victorious, followed by Higgins and Drew. Nick Roberts car had suffered mechanical failure earlier in the day and had been forced to retire, leaving the Super Production Subaru of O’Sullivan and Putnam to take the final podium spot and the Super Production victory. Next up is Oregon Trail Rally in April. Should be another good one!